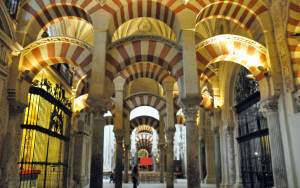 Young Christian girls in Spain dream of marrying in the Mezquita, the Great Mosque of Cordoba. At the same time, Muslims are barred from praying in the building that illustrates the best of early Islamic architecture and manifests Spain’s turbulent religious history. During the early first millennium A.D., the Mezquita’s current location was the site of a temple to Janus, the Roman god of beginnings. In the sixth century, Cordoba was captured by the Visigoths, Germanic Christians deemed heretics by the established church because they refused to accept the divinity of Jesus. After their leader converted to orthodox Christianity in 589, the Visigoths razed the temple and built a church, whose mosaic floor can be seen through a cut-out in the floor of the Mezquita. Muslims from North Africa conquered Cordoba in 711 and used part of the Visigoth church as their mosque. Later in the eighth century, Abd al-Rahman I, an exile from Syria, established an Islamic dynasty centered in Cordoba and reportedly purchased the site of the Visigoth church for a mosque modeled on the Great Mosque of Damascus. The mosque was expanded by al-Rahman I’ssuccessors until it covered almost six acres. A flat wooden roof, capable of shading 20,000 worshippers, was supported by 856 Roman columns from earlier buildings, their heights extended by novel double brick and stone arches suggesting palm trees. In 1236 Christians reconquered Cordoba, at the time one of the most important cities in the world. Instead of demolishing the Great Mosque, as they had other Spanish mosques, church leaders removed a large section of the roof and the columns supporting it and erected an ornate cathedral in the middle of the mosque. The cathedral, incorporating gothic, baroque and renaissance themes, remains surrounded by the original columns. When Holy Roman Emperor Charles V observed the mutilation of the mosqueby the embedded church, he reportedly expressed regret at having authorized the construction. That decision nonetheless preserved most of the Mezquita, now Spain’s second most visited site. Perhaps someday the descendants of those who built it will be allowed to pray in Spain’s only surviving mosque.